The line-up for the Made in UK Showcase at the Christ Church venue at thei year's Xerox Rochester International Jazz Festival (June 23 – July 1 2017) is announced. Following the untimely death of Made in UK's founder-instigator and director John Ellson, this tenth year's programme has been put in place by Sue Edwards. As the press release says: "It remains the largest presentation of British Jazz outside the UK and several of the bands will also be performing on the Canadian festival circuit this year." Sue Edwards says: "Since the very sad loss of Made in the UK founder/director John Ellson last year, it has been an honour to carry on this important collaboration with the XRIJF, one that gives British jazz musicians the unique opportunity to perform in the USA and on the Canadian jazz Festival circuit. We look forward to celebrating the tenth anniversary of the Made in the UK series this year and dedicate it to the memory of our dear friend and colleague." Tessa Souter is made in U.K.? Phronesis, managed by Edwards, is not a Uk based trio, comprised of only one Englishman. Does Phronesis need to be subsidised with their international stature? How about some other young bands who are actually from the UK who could use the exposure? To clarify, there is currently no public subsidy for the Made in the UK series and there hasn’t been for several years. Bands can apply individually to the PRS Foundation’s International Showcase Fund, but other than that they are self-funding. 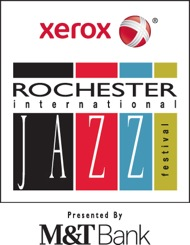 The Rochester Jazz Festival Director always makes the final selection of bands for the series, and Tessa Souter (who was born in the UK) was asked specifically to return to lead the tribute concert for John Ellson, as she was one of the first musicians to be booked for Made in the UK when the series began. It's made in the UK but also you showcase bands from outside the UK (Phronesis)? So how can bands from outside the UK apply to this? Do you have to have British musicians in the band? I am interested for my own band. Thanks. Terry there is a contact link if you go to the Made in U.K. Website - see the text of the article above.